Susan J. Pharr, "The Enigma of U.S.-Japan Relations: A 50-Year Perspective"
The global community of "Japan specialists" is truly diverse, spanning scholars in the humanities and social sciences, practitioners in governments and think tanks, business and legal professionals, and the like. Members―both established and new―regularly trade stories about current events or share tips about professional opportunities at major academic conferences, corporate events, and embassy receptions. 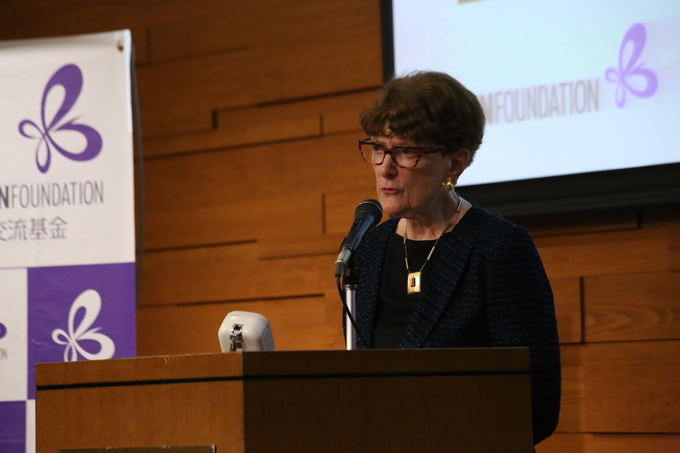 For the last four decades, Susan J. Pharr, Edwin O. Reischauer Professor of Japanese Politics and Director of the Program on U.S.-Japan Relations at Harvard University, and the Japan Foundation have been the cornerstones of this community. 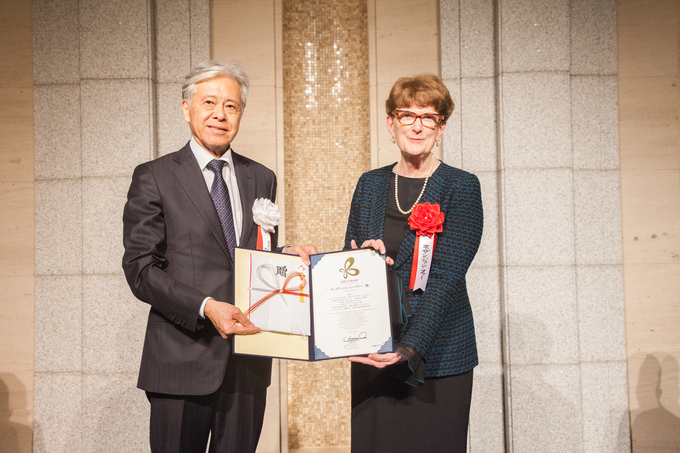 As such, it is only fitting that Professor Pharr was selected to receive the 2016 Japan Foundation Award, and it is my honor to discuss her commemorative lecture, "The Enigma of U.S.-Japan Relations: A 50-Year Perspective," delivered on October 21st, 2016 in Tokyo, Japan. Professor Pharr's lecture centers around an observation that is equally prosaic and provocative: that U.S.-Japan relations in the last two decades have been remarkable for their "utter placidity, solidity, and stability." It is prosaic in that few in academia, or the policy world doubt the centrality of this relationship to international peace and prosperity. It is provocative in that the success of the partnership is so seemingly obvious that we rarely step back to understand its origins. Instead of accepting this "placidity, solidity, and stability" as a natural state of affairs, Professor Pharr argues that it is, in fact, an enigma. The United States of America and Japan have a checkered history, including the still-living memories of WWII and heated economic rivalries in the 1980s and 1990s. While both countries share a commitment to freedom and democracy, each also has distinct sociocultural values and geopolitical priorities that could quickly give way to misunderstandings and conflict. Indeed, Professor Pharr cites a survey from 1990 which found that only 44% of Americans "trusted Japan." What, then, explains the fact that public favorability towards Japan now rates at about 80%? Professor Pharr argues that the success of the U.S.-Japan relationship is the result of conscious, gradual investments by individuals and organizations on both sides of the Pacific. 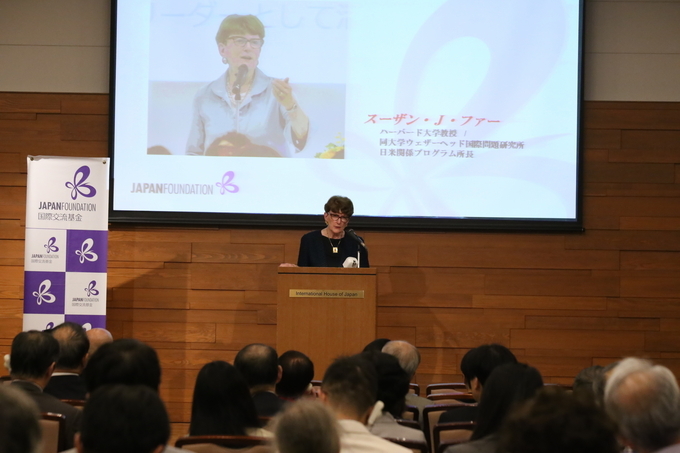 Her lecture, which focuses on Japanese efforts in America, highlights three pillars of this cooperative infrastructure since the 1970s: public diplomacy, Japan and Japan-America societies in the United States, and corporate investments. Professor Pharr focuses on Japanese efforts in America, highlights three pillars of this cooperative infrastructure since the 1970s. The first, public diplomacy, began with early investments by the Japanese government. The Ministry of Foreign Affairs encouraged community engagement through Japanese consulates, including in non-coastal cities like Atlanta and Detroit that other nations have eschewed. Similarly, the Japan Exchange and Teaching (JET) program allowed American students to work all over Japan, exposing them to daily experiences outside of the well-traveled environs of Tokyo. Importantly, the establishment of the Japan Foundation in 1972, and its crucial decision to be guided by an American advisory committee, led to the greater credibility of and respect for Japanese research. Professor Pharr's first position, after receiving her doctorate from Columbia University, was at the Social Science Research Council, where she consulted with Japan Foundation delegates on how to structure the latter's operations. She argues that its investment in faculty expansion grants allowed universities to create Japan-related positions, including at University of Wisconsin-Madison, where Professor Pharr subsequently taught. These efforts not only supported Japanese research, but also introduced thousands of American university students to Japanese politics, business, society, and culture. The second pillar is Japan and Japan-America societies. Their number―now at 37 in the United States―has tripled since the late-1970s, and they serve a vital educational and networking role for Americans interested in Japan. Some events, such as the hosting of Noh dramas and tea ceremonies, showcase Japanese history, while those like obento-making classes and film festivals publicize newer trends. This mixture of traditional and contemporary programs has provided an entry point for a wide range of Japanophiles, ensuring the continuing relevance of Japanese culture in the United States. The third pillar is the support of the Japanese business sector, particularly for Japanese studies at American universities. While the government often made early seed grants, these were followed by generous waves of corporate-giving. Professor Pharr notes that firms could have chosen a more visible publicity route, such as increasing television or print advertisement. Instead, both multinationals and smaller firms took the gradualist route of investing in higher education, including for academic events and student scholarships. Corporate support was particularly valuable when political relations between the countries cooled, such as during the trade conflicts of the 1980s. The early beneficiaries of these investments, notably young students with knowledge of and affinity of Japan, have become the business and political leaders today, further cementing the two countries' relationship. These synergistic investments by the government, parastatals like the Japan Foundation, and the business community were invaluable to the improvement of American public opinion towards Japan. In the last two decades, Japanese efforts have become even more varied, extending outside of elite universities and coastal hubs in Boston, New York, Washington D.C., and San Francisco. Corporations have directed their investments to the American South, where Japanese factories have blossomed and are now embedded in the local socioeconomic fabric. Philanthropic giving to programs without an explicitly Japanese component, such as to the National Museum of African American History and Culture, and sponsorship of "Main Street" events like NASCAR, have built up a reservoir of goodwill where more conventional public relations efforts may have failed. These investments in long-term projects, such as academic funding and community-building, have sustained U.S.-Japan relations despite the two nations complicated histories and cultural differences. In fact, the "placidity, solidity, and stability" of the relationship, which Professor Pharr noted at the beginning of her lecture, makes it far too easy to forget the efforts―both in time and money―that began in the 1960s and continue today. Like many scholars of Japan, I began to study Japanese politics and U.S.-Japan relations out of personal fascination. However, I was only able to translate this into a career because of the availability of research and travel funding to Japan. 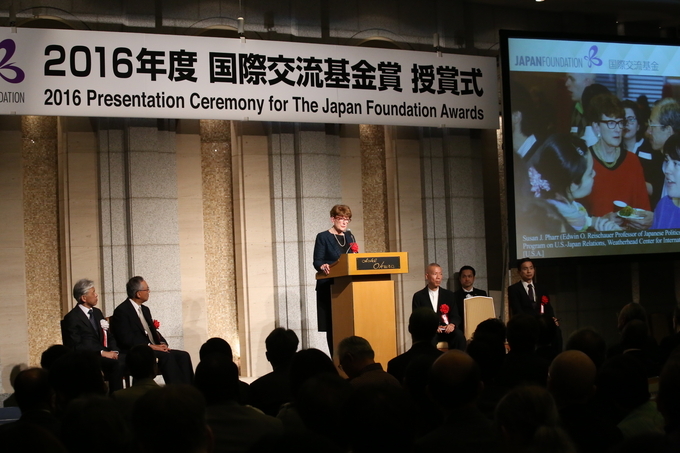 I was the recipient of a Japan Foundation Fellowship in 2012, which made it possible to extend a sabbatical leave for six months. Much of the research I began then, including on Japanese constitutionalism, helped me to secure a position at the University of Tokyo in 2015. These grants are less common for other developed democracies, and even rarer for scholars of Latin America, Africa, and other regions of Asia. Professor Pharr's lecture is also notable for her trademark humility. She has been a mentor to many younger scholars―even from those outside of Harvard―not only in encouraging our work, but also in providing professional opportunities at Harvard's Program on U.S.-Japan Relations and the Reischauer Institute of Japanese Studies. I personally have gotten to know her through her leadership in the program organized by the Maureen and Mike Mansfield Foundation, also funded by the Japan Foundation Center for Global Partnership, which brings together policy-makers and young academics involved in U.S.-Japan relations. Throughout these activities, Professor Pharr has established a strong norm of collegiality and respect, not to say an appreciation for mint julep cocktails and Red Sox baseball. While Japanese studies is not a large field, I have long found my fellow "Japanologists" to be mutually supportive, even where professional competition could have yielded to acrimony. We all follow the standards and examples set by our mentors, and Susan's willingness to extend her hand to her kohai* has made us more cognizant of our own responsibilities to our colleagues and students. 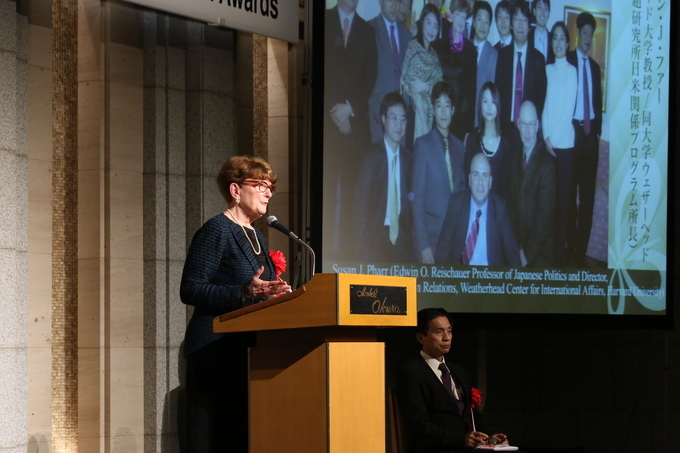 In that sense, Susan Pharr's legacy, and the invaluable support of the Japan Foundation, has blessed multiple generations of Japan specialists. We would not exist as a community were it not for her leadership and generosity, and for that, we owe her an enormous debt of gratitude. * Kohai means "junior" in Japanese. 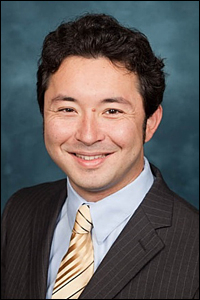 Kenneth Mori McElwain is an Associate Professor at the Institute of Social Science, the University of Tokyo. His research focuses on comparative political institution and constitutional design. He received his BA from Princeton University and PhD in political science from Stanford University, and previously taught at the University of Michigan before moving to his current post in 2015. He was also a postdoctoral fellow at Harvard University's Program on U.S.-Japan Relations, which Professor Pharr directs, in 2005-06.